I graduated from the Minneapolis College of Art and Design with a BFA degree and continued my graduate education at Pratt Institute in New York where I received an MFA degree. My artwork, which is in several private and corporate collections, represents my ongoing interests and research in ceramics, multi-media, artwear, illuminated sculptures, drawing and painting. is the repository of my many years of experience as an artist and art instructor. I continue to build it with the desire to create a large, information-rich art resource that is available to everyone and is absolutely free. 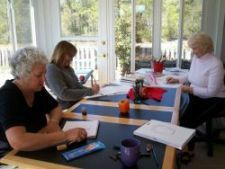 I teach art classes locally in Wilmington NC in my Sunroom Studio. In addition, I am a certified lighting specialist and do residential consultation at affordable rates. Just email me on the CONTACT page for a free estimate for your lighting needs or for the latest schedule of my classes. Gardening and cooking are passions of mine. I am a cookbook author of "Pop It In The Toaster Oven," and have created over 225 YouTube videos about art and cooking. Here are links to my two "Palette and Palate" channels on YouTube.